Your mHelpDesk documents should reflect the needs of your specific business. That's why many of the documents and notifications that are sent from your account can be customized. Templates allow you to change the design of these documents. You can add whatever information you need to include, as well as use keywords that will display specific information from your Jobs, Estimates, Invoices, and more! First, you'll need to login to your mHelpDesk account. Click on Settings > Customize > Templates. Then select the template that you would like to update. On the right-hand side of your selected template, you'll see Valid Keywords. These keywords represent information that can be added from your account. The list of available keywords will change depending on which template you are currently editing. 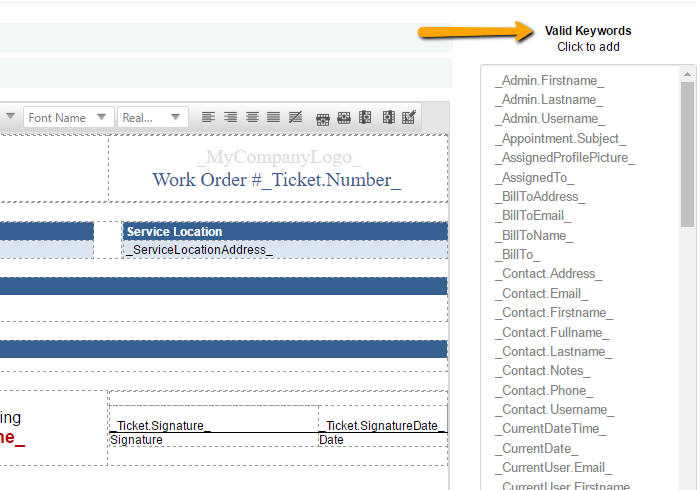 For example, if you would like to add your customer's email to the Job PDF, place your cursor where you would like to add this information and click on the "_Customer.Email_" keyword. Now it will populate on the PDF for you! You can use this method to add other keywords to all of your templates.